The iPhone is pretty popular, but many feel that its camera is somewhat limited. There are several kits out there to add zoom or wide-angle to the phone, but mostly at unfriendly prices (much like the phone itself...). There is, however, an easy and cheap way to take close-up photos with the phone. The simplest and cheapest way is to use any magnifying glass. Just get a 50 cents piece from an office or toy store and hold it in front of the phone's lens. This way, you can take reasonable sharp images at about 2 inches. Keep in mind, though, that a good picture requires light! A big challenge in this scenario could be holding it together. 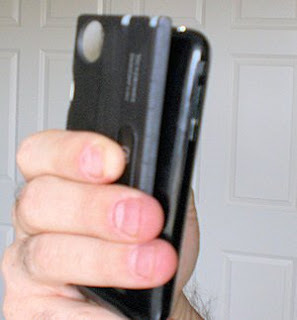 You need one hand to hold the phone, another for the magnifier and a 3rd for pushing the shutter button. 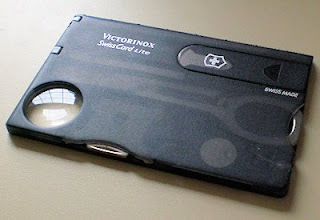 A good solution that is not too expensive is getting the Victorinox SwissCard Lite. These cost about 20 dollars, and can be very handy for a lot of things. The SwissCard Lite has a small magnifier at its corner, so it's very convenient to hold against the phone with one hand, freeing the other one for hitting the shutter. This solution, BTW, can be used with pretty much every camera phone in existence, as most of them don't have Macro mode. Another little helper is the Fast Tap Camera application, available on the App Store for 1$. This application deals with one of the primary problems of the phone - the small size of the shutter button. With this app, the entire screen is the shutter button, so you can take a picture of yourself or just shoot at weird angels without fondling around for the little button. At some age, most kids discover the fun in building plastic model kits of planes, cars and ships. Unfortunately, the excitement usually wears off pretty fast, and even before that, few kids have the attention and patience required to actually paint the models properly. Shortly after, there are a bunch of models laying around and eventually they are dumped in the trash, but there’s one more trick that’s worth trying. If you have a model that’s about to be thrown away, don’t do it! Instead, go to Home Depot or Lowe's and get a can of gold or silver spray paint. Be sure to get the ultra-glossy stuff! Put the model on some old newspapers and spray-paint it. It takes only a few minutes to paint the entire thing, and usually less than ½ an hour to dry. You might have to turn it up-side-down to complete the paint. Cutting glass might seem intimidating, but this skill can be perfected rather quickly and easily, and can be very useful. Want to learn how? Before you try this, beware – glass is not very tolerant of mistakes, and one false move could lead to a nasty injury. Even doing a perfect job would often leave little shards laying around, so don’t do this in your living room. Until you get used to it, better wear good work-gloves and cover your face with a mask or protective glasses. 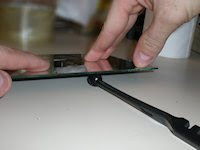 To cut glass, all you need is a rotary glass cutter. These are often sold as kits, for around 5-10$ at any home depot or Lowe’s. 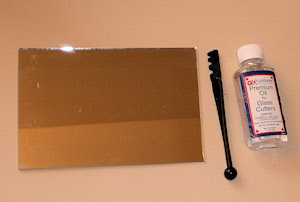 A typical kit contains the cutter, a bottle of cutting oil, and sometimes some instructions as well. If you have such a cutter at home already, be sure not to let it get old. If it gets rusty or worn-out, it will not do its job well. Also, the cutting oil is much more important than you might realize. Another important tool is a metal ruler. To cut the glass, place your ruler and tape it to the glass using some tape – the tape goes on the side of the ruler opposite where we intend to cut, of course! Dip the rotary cutter in the oil and shake-off any excess. 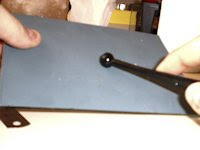 Using the cutter, scratch the glass from end to end in a fast and uniform movement. Make sure you do it from end-to-end and not leaving even a few millimeters undone, as this could lead to the whole piece breaking unevenly. Note that the rotary blade is usually small, so you’ll have to find the right angle of holding it, so the ruler doesn’t keep it too high to touch the glass. Use just little pressure – the cut doesn’t have to be deep, and no matter what, don’t be tempted to do another round. If you missed it the 1st time, make another cut at least 1 inch to the left or right, or get a new sheet of glass. Doing the scratch correctly is the hardest part, and it may take a few practices until you get it right. 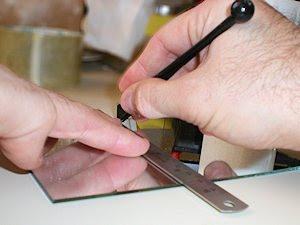 After the scratch, remove the ruler and turn over the glass. Tap on it gently along the scratch a few times using something hard. Usually, the other end of the glass cutter would be shaped like a ball, ideally for this. 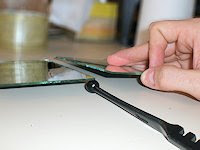 The tapping is not supposed to break the glass, but to give it tiny invisible cracks which will “prepare” it for the final break. Place the glass over a table-edge, and hold it in place. Push gently the protruding side, while holding the glass well so it doesn’t fall to the floor after breaking. Just a small amount of pressure is all that is needed, and the glass should usually break cleanly and easily. Another way is to raise the glass and place a pencil under the scratch, and then push on the glass to make it break. Doing this for the first time is a lot of fun – it feels great to see how it breaks so easily and quickly. Lastly, use some fine sandpaper to smooth the glass edges. Be sure to use gloves at this stage, as the glass could cut the paper and go straight through your hand. Congratulations! You are a glass cutter! If you are also tired of empty cans filling up your trash, you might be inclined to buy a can compactor (a.k.a Can Crusher). However, if you can't or prefer to do things the old fashioned way (by brute force! 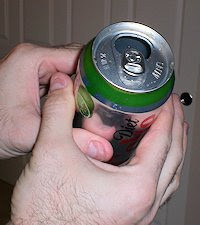 ), here's a way to compact cans by hand, that doesn't require too much strength. 1. Hold the middle of the can with both hands, so that your forefingers and thumbs form a square around the can. 2. Press lightly with all four fingers to bend the can walls inwards, in the shape of a square. 3. Use your thumbs to bend the aluminum above and under the middle-bend. The right thumb pushes right, and the left one pushes left. Repeat four times for each "corner" of the square from step 2. 4. 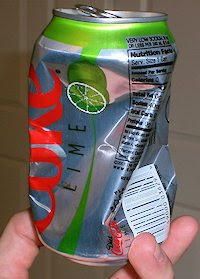 Place the can on a flat surface, and push on it with your palm, while rotating to the left. 5. The bent-pattern you created causes the can to twist and compress, requiring minimal force. Even a child could compress a can to 1/3 of its full size. Word of caution - I've never been hurt using this method, but if you press hard enough, you could injure yourself. Also, never attempt to perform step 4 too fast, as it could cause the can to fly to the side or bend in a way to injure your hand. Practice at your own risk!